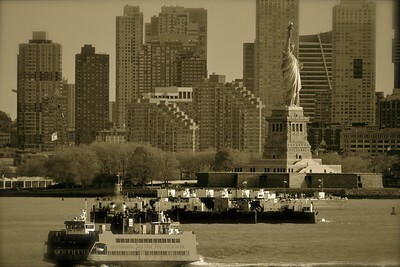 Sailing into the harbour of New York City had a magical sense to it. 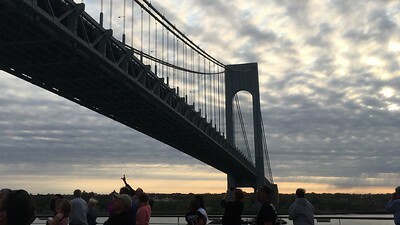 I was still in my pyjamas when I realized that we were approaching the Verranzo Narrows and we would soon be sailing beneath the bridge that connects Brooklyn, NYC to Staten Island. I quickly jumped into some clothes and raced to Deck 11 to snap a few photos. The mad rush and speedy dash was all worth it as within minutes the great Summit was soon squeezing beneath the bridge with little room to spare. How on earth the ginormous “NCL Breakway” squeaked through still baffles my mind! Entering the Upper Bay at sunrise was spectacular. 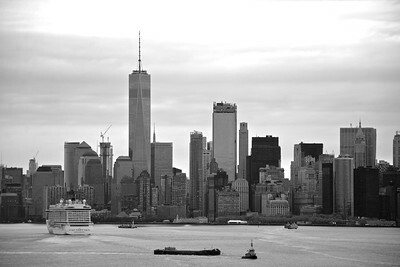 The gorgeous skyline of Manhattan was evident and in the distance, the great Statue of Liberty, herself. My thoughts wandered of the feeling that immigrants may have had as they entered the Upper Bay back in the late 1800s, early 1900s. Little beknownst to many, my great-grandfather left Liverpool, England back in the early 1900s and he was bound for New York City. The ship made a stop in Montreal, Quebec (Canada) and he was offered a job with the Canadian Pacific Railway. He disembarked in Montreal vs. New York City and our family history would be therefore have the fate of emigrating from England to Canada vs. the United States. I thought of my great-grandfather, a man that I had never met – who would have been seeking a new life on a large ship, entering a harbour and embracing the unexpected. His love of his life would sail one year later, joining him in Montreal, where the “Livicks” would have large families in the early 1900s and many of my Livick relatives still to this day, reside in Montreal her surroundings. Upon arrival in Bayonne, New Jersey our disembarkation was delayed due to a cargo ship being the Summit’s designated berth. We had an extended breakfast in Luminae and the joke going around was soon they would serving us lunch! After a while, we knew the staff really needed to prep for the lunch embarkation and we moved to Michael’s to sit and wait out the delay. Eventually, we got the word from Michael’s Concierge, Maja, that we would go at anytime and she escorted us straight to a special line in customs which we whipped through. This was the “first” time in my history of sailing with Celebrity that “priority disembarkation” (via Suite Class) actually paid off! We quickly went through customs and then seeked out a Taxi. It was actually fairly straight forward and “Archie’s Taxi Service” had several shuttle vans picking up groups of passengers on their way to the Airport. We were at Newark Airport (EWR) in relatively good time and then had the long wait for our evening flight back to Toronto. We are very grateful, appreciative and feel blessed for this Spring Cruise get-away. It truly was a very relaxing, uneventful trip that was easy to navigate throughout, deepening our appreciation for this repositioning cruise.